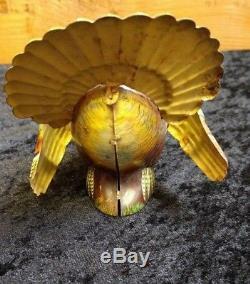 RARE original vintage tin toy wind up mechanical TURKEY made in Germany. It measures 4 inches wide and 4 inches tall and is in good condition with some surface wear. I have no key, but it does wind. 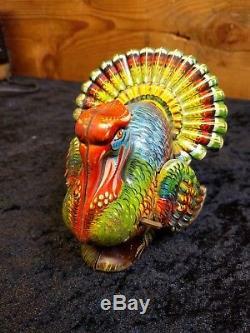 It is supposed to move forward, changing directions and flapping its wings while making a turkey noise. I had to push it a long to test this, but I think it would be in great working order with some oil. 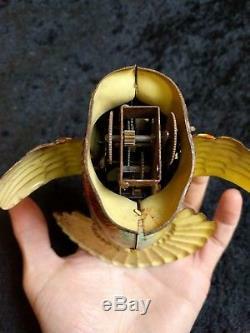 The toy is marked, "GES GESCH GERMANY" on the backside. The item(s) pictured are the exact item(s) you will receive. We handle all items very carefully during the picture taking, storage and packaging processes. We try to take good pictures at various angles of each item and we encourage you to look them over closely and use the zoom feature to see in detail the item you are purchasing. If you have any questions please send a message. 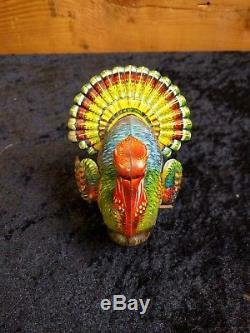 The item "RARE original vintage tin toy wind up mechanical TURKEY made in GERMANY" is in sale since Tuesday, November 6, 2018. This item is in the category "Toys & Hobbies\Vintage & Antique Toys\Wind-up Toys". The seller is "anythingz_everythingz" and is located in Anaconda, Montana. This item can be shipped worldwide.